Yesterday’s photo of the Shinkansen, created a nice leading line, but it’s a bit obvious. 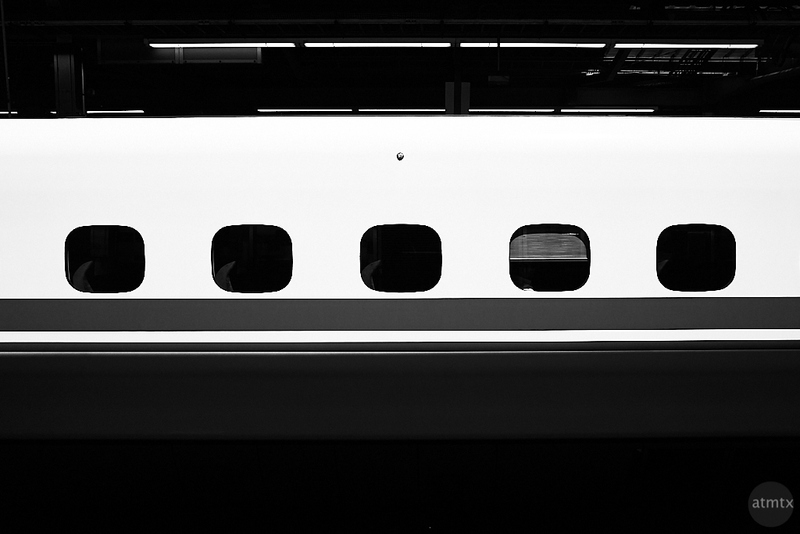 I also wanted to photograph the bullet train in a more unusual and somewhat abstract way. Here’s my attempt. It took a few tries during capture and some post processing to get the symmetrical framing but it came out pretty much the way I hoped. The monochrome treatment simplified and added a layer of abstractness, rendering the train in bands of gray, white and black with porthole like windows for interest. I decided to keep the fluorescent station lighting above the train, which increases the horizontal-ness of the image. The quick snapshots are a nice reminder of Japan but I do get pleasure picking out details. I don’t do it often enough and it takes some effort, but my wish is to make more images like this. Part of my evolution as a photographer, I suppose. Thank you, locksieyu. Removing the lights are certainly possible with some post production. It will certainly simplify the image even more. Perhaps I may in the future. For now, other than making sure the train is straight and converting the image to monochrome, it exists as shot.